Right after last year’s session the legislative committee reviewed all of the resolutions from the session and incorporated the ones affecting legislative affairs into the Connecticut State Grange Legislative Policy Handbook. Copies of this booklet were distributed to Governor Malloy, Lt. Governor Wyman and all members of the Connecticut General Assembly. Gordon Gibson was again our voice at the Capitol communicating our support or concerns on the various bills presented during the session. This year he testified on three bills. The first bill was before the Environmental Committee. Raise Bill 70, An Act Concerning the preservation of lands under control of the Department of Energy and Environmental Protection and the Department of Agriculture. This bill authorized the Commissioner of Energy and Environmental Protection to designate areas of land that the State already owns as areas that must be preserved. This was passed and signed by the Governor. The second bill we testified on was before the Transportation Committee supporting Raised Bill 5288, An Act Concerning Road Treatments. This bill would have required the Commissioner of the Department of Transportation to do a study on the corrosive effects of the liquid road treatments on vehicles; this bill did not move out of committee and died. The third bill was before the Environmental Committee. Raise Bill 5419, an Act Concerning the preservation of the Savin Farm in Lebanon. This bill allows the Department of Agriculture to grant preservation easements on the State owned Savin Farm. At the beginning of the year the Federal Farm Bill was finally passed by the National House and Senate. This was a three year project with many legislators working to get the details together for its passage. The bill is still being implemented nationally. The State Grange sent letters to all of the Connecticut legislators encouraging the support of this bill. National Grange did not host a Legislative Fly-In this year. One was held by Potomac Grange in Washington as part of the regional youth conference but it was at a time that we were unable to attend. National Grange also had a change in their Legislative Directors during the year. The new director is Burton Eller. I attended the Northeast Regional Leaders Conference that was held in Rhode Island this last January. Gordon Gibson attended the Working Land Alliance annual meeting as well as their regular meetings during the year. The Grange is a partner of this organization. He also, as an invited guest, attended an open house that was hosted by Rep. Penny Bacchiochi. Both Gordon and I attended the Connecticut Agricultural Day that was held at the Capitol in March. We spoke with many different legislators that day. We were pleased that Governor Malloy and Commissioner Reviczky stopped by the Connecticut State Grange booth for a photo. I would like to thank our State President, Jody Cameron, for giving me this opportunity to serve as your Legislative Director for the last four years. I also wish to extend thanks to my committee, Charles Dimmick, Russell Gray, George Ward, Earl Phillips and our liaison Gordon Gibson for their work and support. 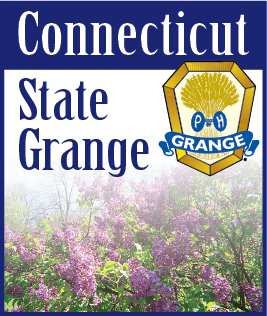 We are proud that the Connecticut State Grange is known and recognized by both our National and State legislators for our concern of rural issues.